We have all seen regular printers that produce pages, some of us have heard of 3D printers that create things. Somewhere in between, there’s a place for another kind of printers. 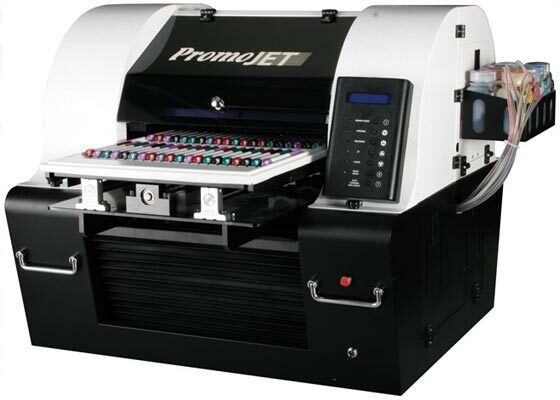 PromoJET Solvent Inkjet Printer applies images on both flat and three-dimensional objects. More difficult surfaces can be printed on with the use of a special pre-spray. The printer is equipped with a 11×18-inch tooling table to place the parts up to 5 inches high. Specialized RIP software controls the color reproduction and the overall amount of ink laid on the product. It is claimed that the PromoJET printer can decorate a full table of parts in less than 3 minutes. This entry was posted on Monday, June 16th, 2008 at 3:38 am	and is filed under inkjet, printer. "17 Ways to Cut Your Printing Costs"
"Xerox Offers Universal Driver for All Printers"